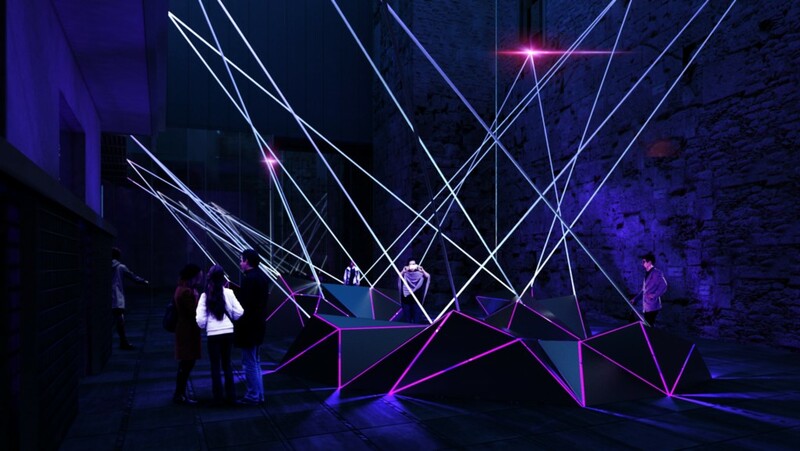 IAAC has once again had the honour of being invited to participate in the Llum BCN Urban Light Festival in Barcelona. Join us at the Pati Llimona, from the 10th to the 12th of February, and participate in our interactive light installation Brillen en la Foscor! 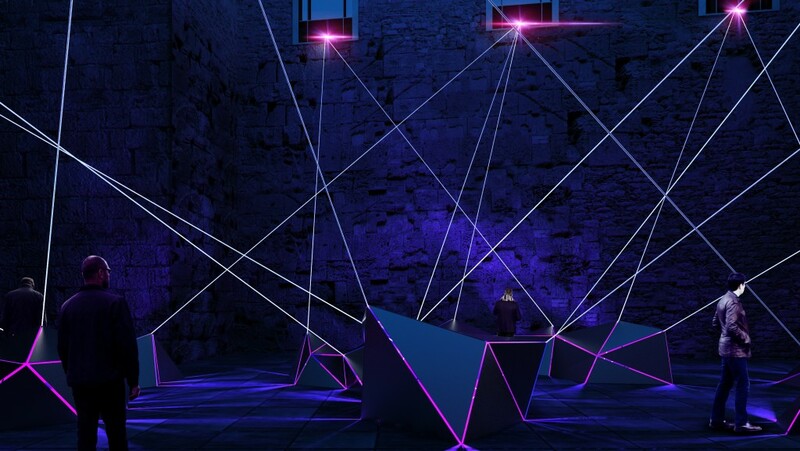 The Brillen en la Foscor installation is an instrument which invites visitors to discover its function and meaning through touch, light, and sound. Visitors to the Pati Llimona are exposed to a field of luminescent strings that weave through the patio anchored at 13 points, each representing the different parts of Santa Eulalia’s experience. By interacting with the instrument, the visitor activates a shockwave of light and sound which reverberate through the instrument’s strings forming a constellation of connections. Multiple visitors are encouraged to play the instrument together to form new patterns of light and compositions of sound. The work seeks to engage the visitors through playful discovery, and furthermore use this engagement to connect people to the story of Santa Eulalia through their senses rather than through an explicit narrative. Brillen en la Foscor will be at the Pati Llimona, Carrer del Regomir 3, from the 10th to the 12th of February 2017. More information soon on the official website of the Festival: Llum BCN. 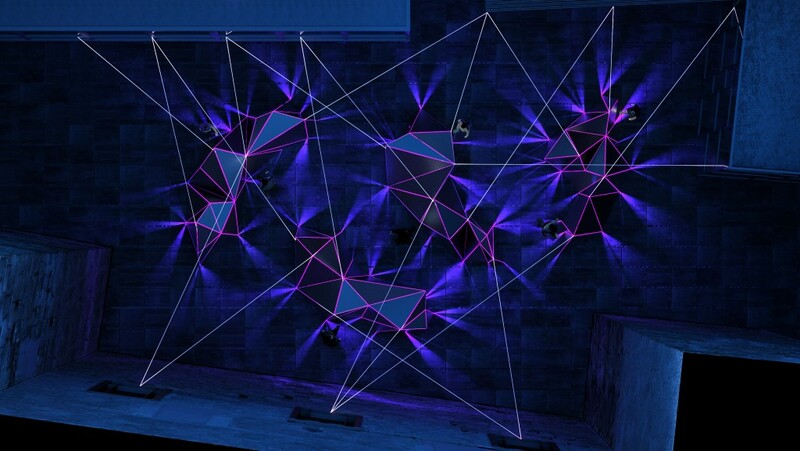 Brillen en la Foscor is a project by IAAC Institute for Advanced Architecture of Catalonia. Students: Nikolaos Argyros, Lalin Keyvan, Jonathan Irawan, Noor El-Gewely, Robert Staples, Inthat Ueasak-Aree, Karthikeyan Dhanabalan, Maryan Ewais, Andre Resende, Firas Safieddine, Martin Hristov. Students: Burak Paksoy, Nisarg Sheth, Fabio Della Barba Menezes, Fernando Baptista, Sureshkumar Kumaravel, Viplav Goverdhan, Yasamin Khalilbeigi, Tobias Deeg, Hsin Li.